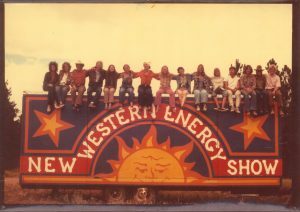 The New Western Energy Show was born in the minds of four people—Elizabeth Wood, Wilbur Wood, Kye Cochran, and Greg Jacobs—sitting around the dining room table in the Woods’ house in Roundup, Montana, January 1976. This birth has a long backstory, dating from minstrels, traveling medicine shows, Chataquas, musicians and actors on tour, to guerrilla theater groups like the San Francisco Mime Troupe. How it came to be focused on renewable energy is a shorter backstory. In 1971 ranchers and conservationists in southeastern Montana began resisting government and industrial plans for massive coal strip-mines and dozens of coal-fired power plants—and a designation for this part of the planet to be a “National Sacrifice Area”. These folks formed a grassroots citizens group called Northern Plains Resource Council. Various members of NPRC wanted to do more than say no to destructive industrial development. They wanted to say yes to creative, life-affirming alternatives for our national power grid. In May 1974, Northern Plains sponsored the Montana Alternative Energy Conference with the support of Humanities Montana, in Billings. This conference was a stunning success, drawing people not only from Montana and northern Wyoming, but also from across the United States. One month later, in June 1974, Cochran, the two Woods, Bull Mountain rancher Anne Charter, organic wheat farmer John Brown of Circle, Montana, Billings businessman Terry Mattison, and Billings media person Ken Taylor met in a house where Northern Plains staffers lived—along with two other people in absentia but in contact by phone: Al Rutan from Wisconsin and George Oberst of Noxon, Montana (both of them small-scale producers of methane from livestock manures and crop residues). These nine founded Montana’s Alternative Energy Resources Organization. Though we did not know this at the time, AERO turned out to be the first citizen-member, non-profit, grassroots organization on the planet whose mission was to promote safe, clean, renewable energy. Our idea was to connect people through conferences, hands-on workshops and a newsletter, AERO Sun-Times: networking, long before the Internet. Though mainstream media did not take AERO’s message seriously, people flocked to the workshops. One such event, a wind power workshop in November 1975 in Billings, attracted Greg Jacobs, an architect from Fort Wayne, Indiana, whose dream was to put educational displays and productions on railroad cars and travel from place to place. Greg heard Elizabeth and Wilbur talking about creating a traveling energy show—another example of creating our own media—and asked if the Woods, and Kye, were serious about this idea. We said yes. Greg returned to Montana in January 1976 for our meeting, and soon after sent complete architectural plans laying out a traveling energy show--the vehicles, the trailer, the circle of exhibits, the stage--thus setting in motion AERO’s unique and revolutionary combination of theater and technology, workshops and fun. We realized we really had to do it.